What should you watch out for when installing a lightning arrester? Lightning arresters, also known as arresters, surge protectors, surge protectors, overvoltage protectors, etc., mainly include power surge protectors and signal surge protectors. Lightning protectors are protected from lightning strikes through modern electrical and other technologies. The device is damaged. The lightning energy absorption in lightning arresters is mainly zinc oxide varistors and gas discharge tubes. 1. This series of single-phase power surge arresters adopts a dark full-metal shell, which has good sealing performance and is safe and reliable. 2. This series of single-phase power surge arresters are connected in parallel to the protected equipment; do not disassemble this series of products without authorization. 3. The user should correctly connect the wiring on the arrester. The grounding wire should be insulated yellow-green copper wire with a cross-sectional area of â€‹â€‹not less than 25mm. The length of the ground wire is as short as possible to reduce the ground resistance. 4. This series of products is equipped with mounting accessories at the factory. Users can install and connect the cables according to the actual situation. After power failure, it can be put into operation. If the important components inside the power surge arrester fail, replace them immediately. 6. During the use of the power lightning protection box, you should periodically check and check the working status of the indicator lamp: The green indicator lamp is the working indicator. Should be repaired or replaced in time. 7. 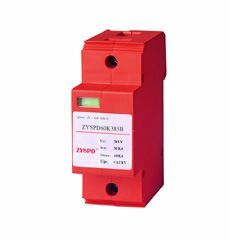 The lightning counter of the power lightning protection box has a count range of 0~99 times, and the counting action current is not less than 5KA. There is a counter clear button at the top and the counter can be cleared at any time after viewing. 8. Grounding resistance is not more than 4Î©. The single-phase integrated power lightning protection box is when the inductive intrusion invades the power transmission line, and the surge protection component of the lightning arrester is in the order of nanoseconds. The resulting overvoltage is limited to the withstand voltage range that the protected equipment is allowed to withstand to ensure safe operation of the equipment. Next Post: Egypt discovers 16 huge right hand skeletons confirming the legend of "changing hands for gold"